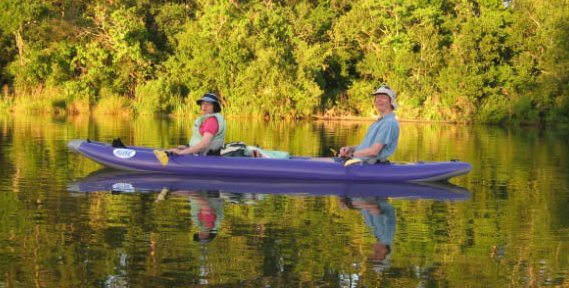 I was talking to my friend who lives in Houston about our upcoming trip when she said, “We’re thinking of going kayaking on Sunday night, but we’d have to rent some kayaks.” She went on to tell me the cost and ask if we’d be OK with that. 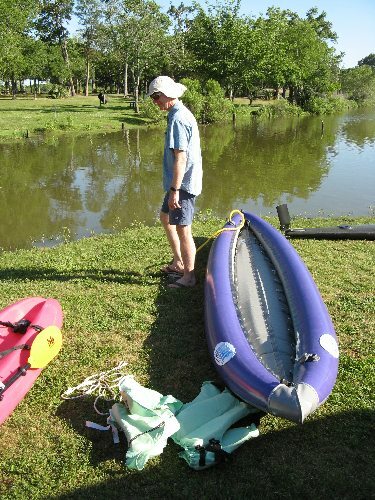 Our fourteen-foot long kayak folds up into a bundle that will fit in a large duffle bag. It weighs about 45 pounds packed, so we were able to get it on the plane. 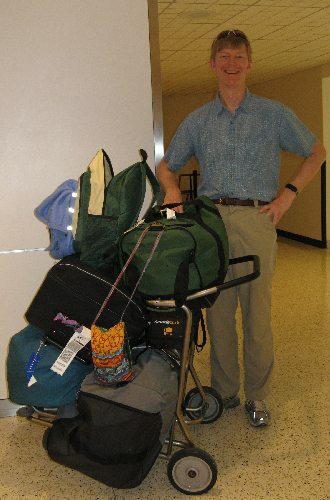 But along with our camping gear, which we needed for our planned three-day trip down the Neches river in Big Thicket, we had a lot more luggage than usual. Kurt and all our luggage. The kayak is in the gray bag on the bottom. Our maiden voyage on Sunday night was at Bay Area Park. Getting the kayak ready to go only takes a few minutes and some leg muscles. We have a foot pump for inflating it, and it works great. Fortunately, it’s easy to operate. While it came with directions, they are translated (badly) from Italian. A typical example: To inflate the tubulars, start inflating with the inserted cap, by exploiting completely the capacity. Once we got out on the water, things went smoothly, although I was anxious most of the time. I have almost no paddling experience and felt really out of control. The fact that there were things that we needed not to hit — other boats, the shore, alligators — added to my stress. I couldn’t seem to remember the things I’d read about kayaking before we left on our trip. It helped that Kurt was in the boat with me and did most of the steering. I’m sure my high stress levels worried him because we had a long trip planned. But mostly I was suffering from beginner’s jitters, compounded by the fact that I was afraid of doing something stupid in front of my friends. We did have some close encounters with wildlife. We saw herons and alligators. We heard barred owls in the woods on shore. We saw fish (we think they were mullet) leaping frantically out of the water to evade some unseen predator. In fact, one of the fish jumped right into our kayak, smacking Kurt in the stomach. I was glad it hit Kurt and not me. I might have jumped out of the boat. We had hoped to christen the boat that night, and write the name on the bow with a marker. We hadn’t been able to settle on a name, however, despite hours of entertaining discussion and a whole range of ideas, and nothing new came to us that night. We decided to wait for the Neches trip and see if the kayak might name itself. Pictures of the rest of our boating party can be found on my Facebook page.